Hope you’re all enjoying the start of the fall season! It’s certainly been busy, with high numbers of Common Murres washing in to many COASST beaches. Thanks so much for helping us to document this event – we couldn’t do it without you. Below is an infographic and additional information that we’ve put together with the data that we’ve received so far. 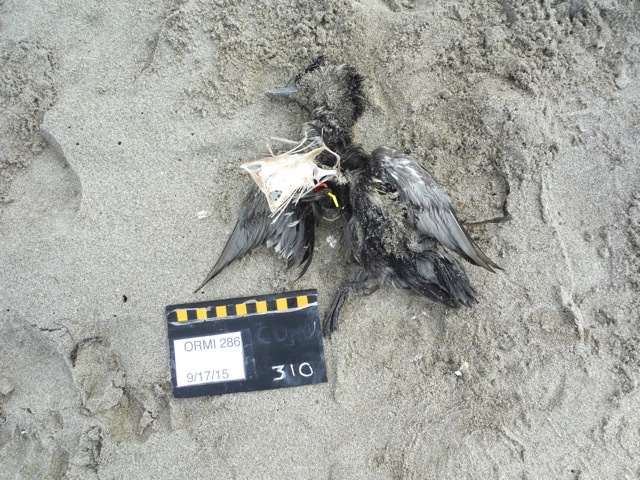 Along the outer coast of Washington, the carcass encounter rate is significantly higher (stars) than normal (gray area), as well as than any other year in the COASST record. 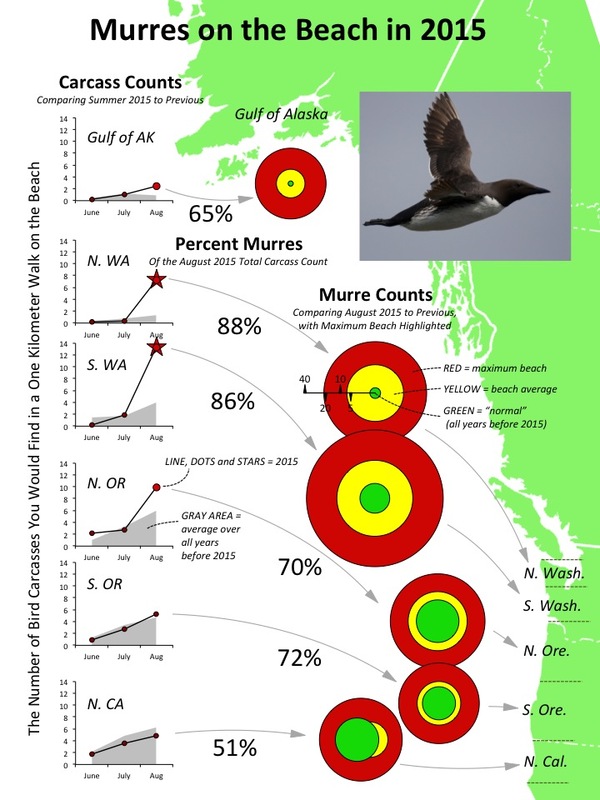 Murres are also significantly above normal (see green versus yellow on bull’s eye plot) in Washington, with the maximum beach spiking to 3-4x average (see red versus yellow). 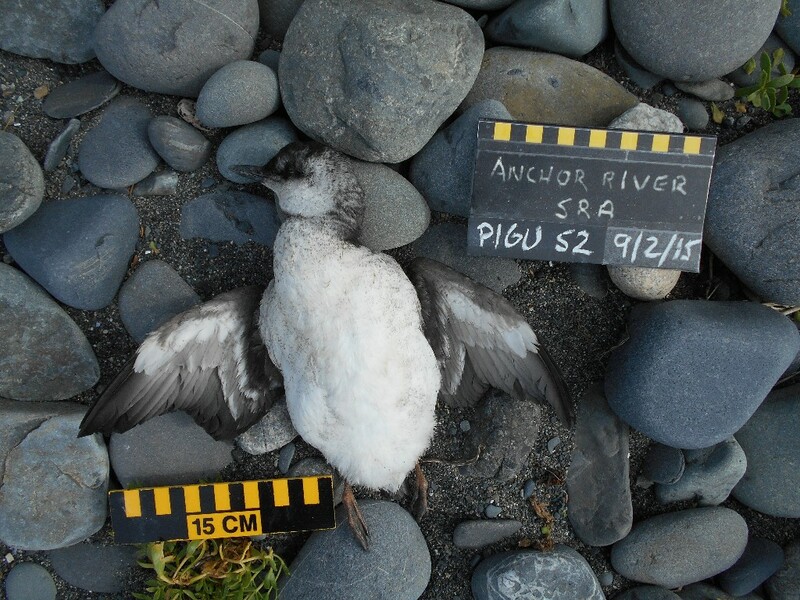 For murres, the long-term average in Oregon and northern California is not different than the 2015 value, even though single beaches (e.g., the maximum value) are reporting high values. 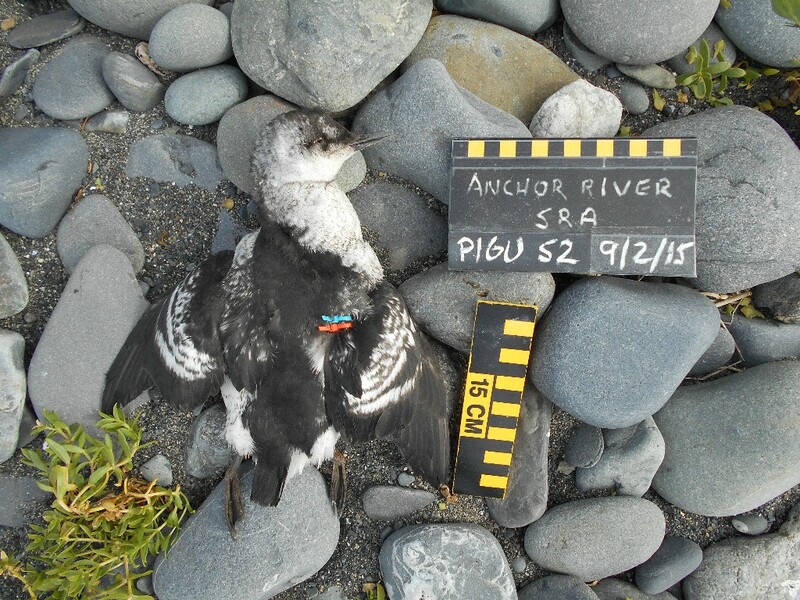 In the Gulf of Alaska, murre numbers are contributing to higher than normal carcass counts, although this signal pales in comparison to the lower 48. Note that the long-term averages are variable length intervals: AK from 2007, N. WA – 2002, S. WA – 2001, N. OR – 2002, SOR – 2006, N. CA – 2006. Please let us know if you have any questions. We’d be happy to help. Now, let’s take a look at what else has washed in! During a very COMU filled survey at Anchor River State Rec Area in the Gulf of Alaska on September 2, Michael and Lisa also encountered these two birds among the 30 from their day. Choose webbed (go to Q2), completely webbed (go to Q3), three toes: all webbed (go to Q4), foot not huge – STOP: Alcids. On AL1 veer left – wing chord is more than 15cm. Bill is dark, slender, featureless. Upperwing dark w/ large white patch. STOP: Guillemots, AL7. Underwing gray-to-pale linings – PIGU! Note there is some white in the underwing linings, but not including the base of the primaries and secondaries. PIGUs in Alaska tend to have a bit more white here than in the lower 48. Upperwing mottled white patch – immature! On AL1 veer left – wing chord is more than 15cm. Bill is dark, slender, featureless. Upperwing dark w/ large white patch. STOP: Proceed to species pages Murres & Guillemots, AL2 and AL10. The measurements are too large to be an adult COMU. We can also rule out an immature COMU because the wings are proportional to the body (not stumpy) and the upperwing is not completely dark. Go to PIGU – measurements are a little small but within reason. Upperwing mottled white patch – immature PIGU! Choose webbed (go to Q2), completely webbed (go to Q3), 4 toes, 3 webbed, 4thfree (go to Q5), tarsus not more than 12mm across (go to Q6), 4th toe shape is loped, w/ flap extending to nail – STOP: Waterfowl: Diving Ducks. Common Goldeneye WF31. Measurements too small and our bird does not have white above the speculum on the wing. Nope. Barrow’s Goldeneye WF33. Same as with the Common Goldeneye. Black Scoter-F WF17. Outer primary not shorter than the next 2 and measurements generally too small. Steller’s Eider would be a very rare find on the West Coast, so let’s stick with female BUFF! Lee encountered this rather large piece of debris (from a dock?) during his September survey at Old Mill Park in Washington. 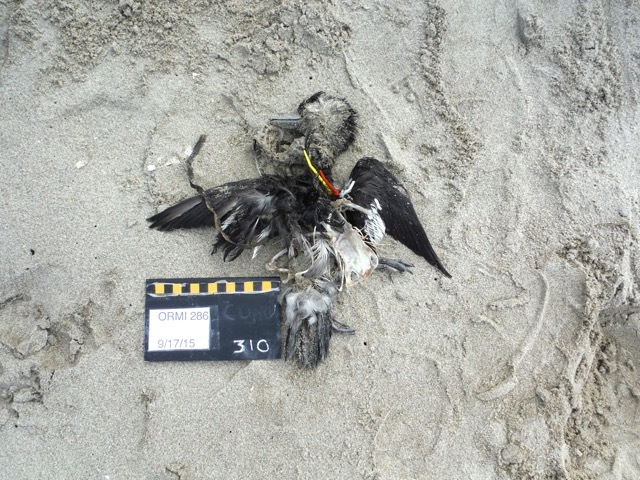 When COASST launches large debris monitoring (soon!) each piece of large debris (anything greater than 50cm in longest length) will be marked so that we can keep track of refinds and persistence month to month. 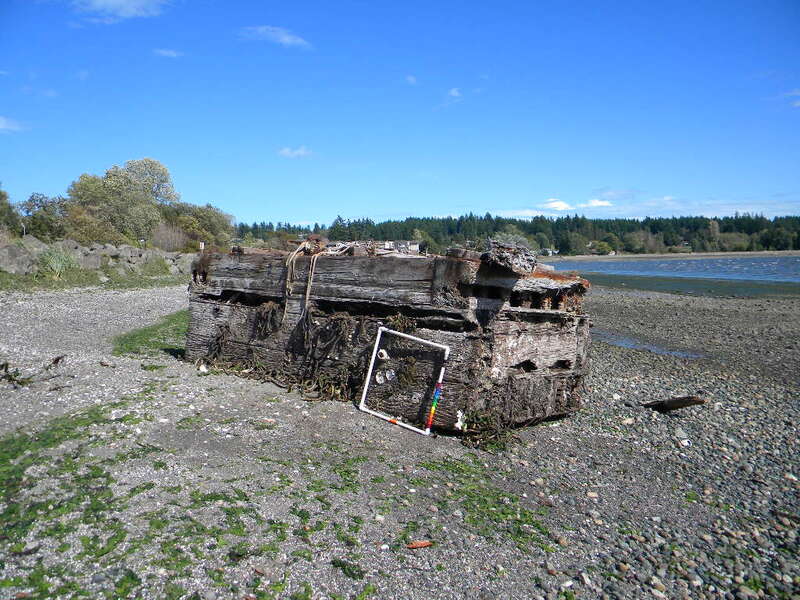 And a reminder for those of you in the Puget Sound, large debris items, creosote covered logs, and derelict vessels found can be reported to the WA DNR debris removal program. They rely on reports to prioritize removal actions and can be reached at 360-854-2808. 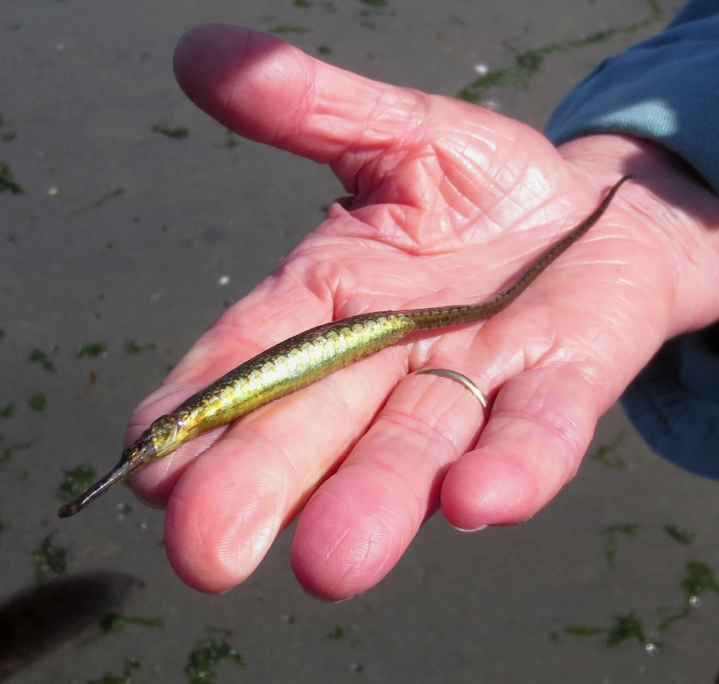 Check out the pipefish that Rayna found at Sunset Beach in Washington! Pipefish are small, straight-bodied fish in the same family as seahorses and seadragons. Because they are weak swimmers, pipefish are often found sheltered in coral reefs or seagrass beds. They are carnivorous and their diets consist mostly of newborn fish, small crustaceans, and fish eggs. Like their seahorse relatives, pipefish also leave most of the parenting duties to the male. The male provides all the care for offspring by supplying them with nutrients and oxygen when they are in a brood pouch. This entry was posted in Uncategorized on September 24, 2015 by coasst.